Brown Acrylic Frame - 4"x6"
About this 3- In -1 Calculator Picture Frame LCD Digital Clock:3-in-1 calculator, picture frame, and lcd digital clock.Back side includes metallic silver full-size desk calculator with raised black plastic buttons and 12-digit lcd digital display.Front side features 3-1/2" x 5" photo frame with protective glass insert and lcd digital clock.Requires 2 aaa batteries (included). About this 4 x 6 Photo Frame:Aluminum.Stands either horizontal for vertical.Easy to remove back, Holds 6"w x 4"h pictures.Material: Metal NOTE: Product comes with Prop 65 warning label. Label reads: "WARNING: This product may contain carcinogen, which is known to the State of California to cause Cancer and Reproductive Harm. For more information, go to www.P65Warnings.ca.gov. Special Instructions:Rush Service:May only be used on regular web quantity orders and one color imprints. About this Aluminum Frame - 4x6:This traditional frame offers a sleek design and great finish while holding a 4" x 6" photo. Perfect for any occasion or location. Manufactured By Leeds. Note: Instructions Included: No Materials: AluminumSpecial Instructions:Other imprint methods/areas may be available; please call for details. Please note that product images may not depict the standard imprint method included in pricing. About this 7 Desktop Digital Photo Frame:7" LCD screen. Resolution: 480 x 234 pixels. Supports JPEG files. SD, MMC, MS, and XD card cards. Key holes for wall mounting. Removable stand for displaying vertically or horizontally. Includes AC adapter. Manufactured By Leeds. Note: Instructions Included: No Materials: ABS PlasticSpecial Instructions:Other imprint methods/areas may be available; please call for details. Please note that product images may not depict the standard imprint method included in pricing. About this Bamboo Photo Frame:Holds standard 4" x 6" photo. Easel stand for vertical or horizontal display. Manufactured By Leeds. Note: Instructions Included: No Materials: Bamboo Related Search Terms: Photo FrameSpecial Instructions:Other imprint methods/areas may be available; please call for details. Please note that product images may not depict the standard imprint method included in pricing. About this 5 x 7 Aluminum Frame:This high quality aluminum frame holds a 5" x 7" photo. Fits perfect on any desk at home or in the office. Manufactured By Leeds. Material: AluminumSpecial Instructions:Other imprint methods/areas may be available; please call for details. Please note that product images may not depict the standard imprint method included in pricing. About this The Starlight Photo Frame:This aluminum photo frame holds a 4" x 6" photo.Material: Aluminum.Special Instructions:1 Day Rush, available upon request for 1 color, 1 imprint location orders. About this Galvanized Frame 8X10:This traditional frame offers a sleek design and great finish while holding a 8" x 10" photo.Perfect for any desk or wall.Material: Metal.Special Instructions:Other imprint methods/areas may be available; please call for details. Please note that product images may not depict the standard imprint method included in pricing. About this Metropolitan Acrylic Frame:Use this frame in pre- or post-event mailers. Before the event, frame an invitation and mail it to key clients. After the event, follow up by sending prospects a framed photo taken during the festivities. Magnetic frame securely holds a 4" x 6" photo. Manufactured By Leeds. Note: Instructions Included: No Materials: Bonded Lthr Related Search Terms: Picture Frame , Acrylic Frame Special Instructions:Other imprint methods/areas may be available; please call for details. Please note that product images may not depict the standard imprint method included in pricing. About this Jadis I Desk Clock Photo Frame:Shiny silver photo frame is paired with an analog clock that features Roman numerals and quartz movement. Finish / Material: Metal, Glass. 4" x 6" Analog Clock. Roman Numeral Clock Face. Quartz Movement. 4" x 6" Photo Frame. Shiny Silver Hinged Design. 1 AA Battery Included.Special Instructions:Rush Service:1. Purchase Order must clearly state artwork instructions and logo to be used.2. One Color/One Location Imprint Only. About this Thetis - 4 x 6 Photo Frame:Photo frame holds a 4" x 6" image and features shiny nickel plating with solid brass construction, a beaded inner edge and felt easel back. Finish / Material: Metal. Beaded Inner Edge. Felt Easel Back.Special Instructions:Rush Service:1. Purchase Order must clearly state artwork instructions and logo to be used.2. One Color/One Location Imprint Only. About this Antimo Clock Photo Frame:Brushed aluminum desktop 6"x4" photo frame and clock. Finish / Material: Aluminum, Glass.Special Instructions:Rush Service:1. Purchase Order must clearly state artwork instructions and logo to be used.2. One Color/One Location Imprint Only. About this Novae Mobile Phone Holder Photo Frame:This cell phone stand holds devices up to 2 1/2" wide and is paired with a 2" x 3" photo frame. Folds flat for easy mailing. Finish / Material: Leatherette. Black Leatherette Finish. White Contrast Stitching. 2" x 3" Photo Frame. Mobile Phone Stand. Interior Stand Width 2 1/2". Folds Flat & Fits in a No. 10 Envelope for Easy Mailing.Special Instructions:Rush Service:1. Purchase Order must clearly state artwork instructions and logo to be used.2. One Color/One Location Imprint Only. About this Orso 6 x 4 Photo Frame:Brushed aluminum dropped bottom 6" x 4" photo frame. Finish / Material: Aluminum, Glass. Felt Easel Back.Special Instructions:Rush Service:1. Purchase Order must clearly state artwork instructions and logo to be used.2. One Color/One Location Imprint Only. About this Photo And Memory Box:Leatherette Box Holds Photos Or Other Keepsakes.4" x 6" Picture Frame On Lid.Special Instructions:Rush Service:Catalog Quantities Only.One Color And One Location. About this 4 x 6 Brushed Aluminum Frame:A large imprint area is perfect for your company logo. Brushed aluminum frame with cardboard back. Materials: Aluminum Related Search Terms: Photo FrameSpecial Instructions:Rush Service:The standard imprint method, 1-color/ 1-location is available. About this 4 X 6 La Porte Stitched Photo Frame:Made Of Polyurethane MaterialChoose Between Portrait Or Landscape View For CustomizingSpecial Instructions:Rush Service:Catalog Quantities Only.One Color And One Location. About this 4 x 6 Colorful Brushed Aluminum Frame:A colorful take on our standard 4" x 6" aluminum frame. Show your photos off in style. Brushed aluminum frame with velvet back. Materials: Aluminum Related Search Terms: Photo FrameSpecial Instructions:Rush Service:The standard imprint method, 1-color/ 1-location is available. About this 5 x 7 Photo Frame:Aluminum.Stands either horizontal for vertical.Easy to remove back.Holds 7"w x 5"h pictures.Material: Metal NOTE: Product comes with Prop 65 warning label. Label reads: "WARNING: This product may contain carcinogen, which is known to the State of California to cause Cancer and Reproductive Harm. For more information, go to www.P65Warnings.ca.gov. Special Instructions:Rush Service:May only be used on regular web quantity orders and one color imprints. About this Heron 8x10 Photo Frame:The Heron metal photo frame has a ridged inner bevel and holds an 8"x10" picture.Finish / Material: Aluminum.Special Instructions:Rush Service:1. Purchase Order must clearly state artwork instructions and logo to be used.2. One Color/One Location Imprint Only.Other imprint methods may be available; please call for details. Please note that product images may not depict the standard imprint method included in pricing. About this Brown Acrylic Frame - 4x6:Wooden appearance base photo frame holds 4" x 6" with a clear acrylic cover that is held into place with magnets. This quality frame is over 1" thick and will add a nice touch to the office or home. Manufactured By Leeds. Note: Instructions Included: No Materials: AcrylicSpecial Instructions:Other imprint methods/areas may be available; please call for details. Please note that product images may not depict the standard imprint method included in pricing. About this Galvanized Frame 5X7:This traditional frame offers a sleek design and great finish while holding a 5" x 7" photo.Perfect for any desk or wall.Material: Metal.Special Instructions:Other imprint methods/areas may be available; please call for details. Please note that product images may not depict the standard imprint method included in pricing. About this Galvanzied Frame 4X6:This traditional frame offers a sleek design and great finish while holding a 4" x 6" photo.Perfect for any desk or wall.Material: Metal.Special Instructions:Other imprint methods/areas may be available; please call for details. Please note that product images may not depict the standard imprint method included in pricing. About this 5X7 Cork Frame:This traditional frame made out of cork holds a 5"X7" photo. Perfect for any desk.Material: Cork.Special Instructions:Other imprint methods/areas may be available; please call for details. Please note that product images may not depict the standard imprint method included in pricing. Thank you Anna, Ashlyn and Ethan. We love to read positive reviews on our promotional products. We always aim for perfection for every customer! The Photo Frame With Multifunction Digital Display is great to give as an employee incentive. Your employees will be able to have this promotional desk calendar and photo frame on their desk with your company logo on it. 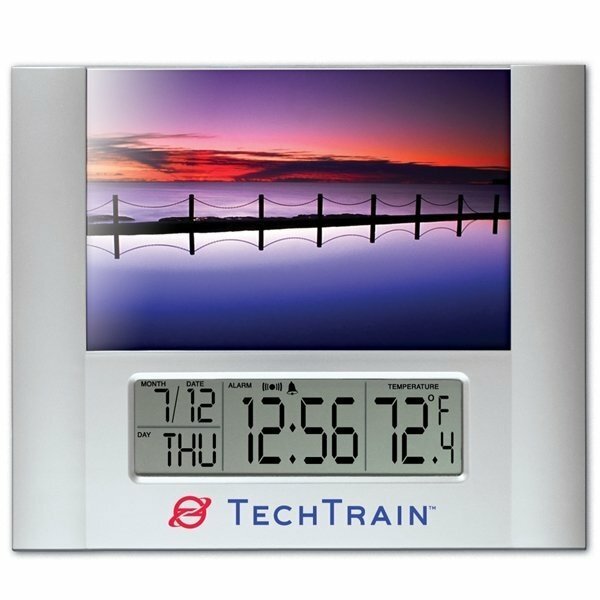 Multi function alarm clock w/ photo frame. Digital display features time, month, date/day & thermometer. Holds 4" x 6" photograph. Operates on 2 "AAA" batteries (included). Thank you Ariana and Brooklyn for your reviews. This is a great product to gift for customers. They will appreciate the thought and professional look it has to it. Metallic silver finish, glass covers a 4 x 6 photo. Digital clock, with alarm, calendar and temp (°F/°C). Thank you Natalie and Ryan. We’re glad to read your positive reviews. Our calculators and frames are all high quality, and the 3-in-1 in this promotional item definitely proves its worth. Side one: Metallic silver full sized desk calculator with raised black plastic buttons and top shiny black 12-digit display on top. 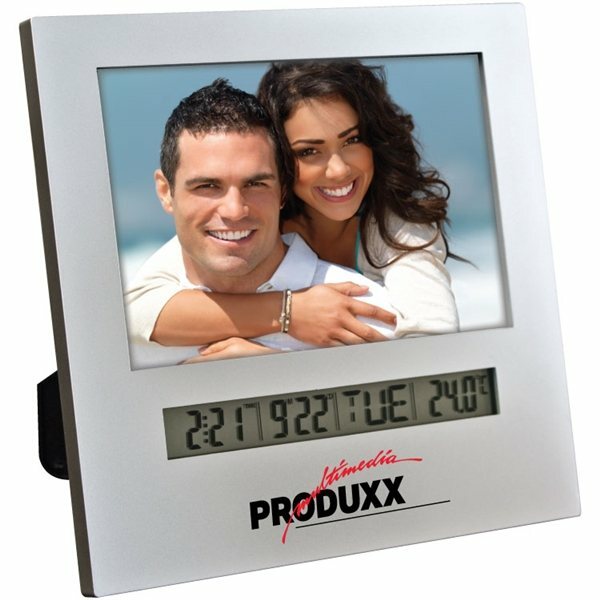 Side two: Metallic silver 3-1/2" x 5" photo frame with protective glass insert and LCD digital clock. Order your 3-in-1 Calculator Picture Frame LCD Digital Clock here. With over 350 promotional frames & albums available in our selection, you’ll be able to pick the perfect frame to display your favorite memory. We have photo frames with digital clocks, calculators, phone holder, and so much more! If you need your photo to be display on a magnet, we have those too! Choose the perfect promotional frame for you! Frames & albums are great for every household! They bring a level of comfort to guests. Share your favorite memory on a frame or album by displaying it for everyone else to see. Everyone loves to see or hear of other’s memories. Let your logo be displayed on a frame or album as your customer shares their story! Look through our selection of frames and albums. Shop here! Just like our customers, AnyPromo sets the bar high when it comes to making a big brand impact while getting the best bang for your buck! Search our frames & albums inventory to find what best fits your promotional goals. All too often, guests who attend trade shows are given logoed handouts from registration to the time they leave. With our wide selection of specially priced frames, albums, calendars, and more, you save money and make great impressions at events. Let’s make marketing make cents! Below you’ll find a list of some of our trending promotional frames, albums, and more. Every item is available and waiting for you to order. Frames and albums are a popular promotional item for any event! Customers will love to receive these to take home! If you’re company revolves around photography, then promotional frames and albums are just for you! Don’t miss out on this great marketing tool. Our featured list of frames and albums have been a success at many events When it comes to frames & albums, you’ll love saving all your memories!